← Ben & Mace Camp Wedding Celebrations! Theodore Turley’s daughter, Charlotte married Jacob Bushman and they had 10 children. Grace Honor Bushman, my great grandmother, was number seven. born in Lehi, Utah in 1873. 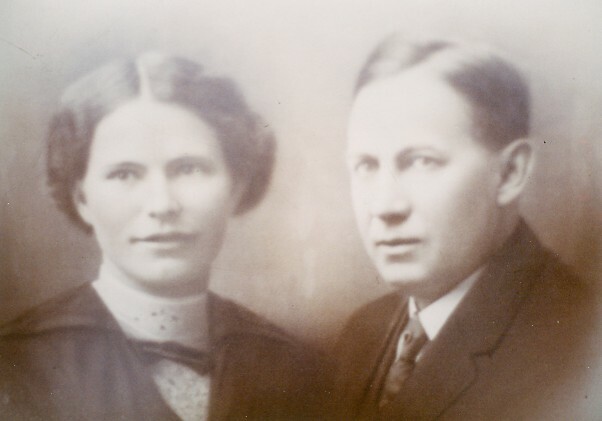 In 1892 when she was 18 years old she married Emanuel Richard Lundquist. They had a happy family with 8 children: Clarence, Leo, Ruby, Carl, Roy, Elsie, Lucille, and George. In 1912, when George was only 4 years old, Grace died of influenza and pneumonia. She was only 38 years old. I will say more about this dear mother at another time. Tomorrow Adam and 6 of his good friends are moving into the Farm House for Fall semester. We’ve been getting things over there ready to receive them. Last night as we were sorting out beds and bedding, I came across an old scrap patch quilt Aunt Ada made for our family long ago. Aunt Ada lived to be almost 90 years old. 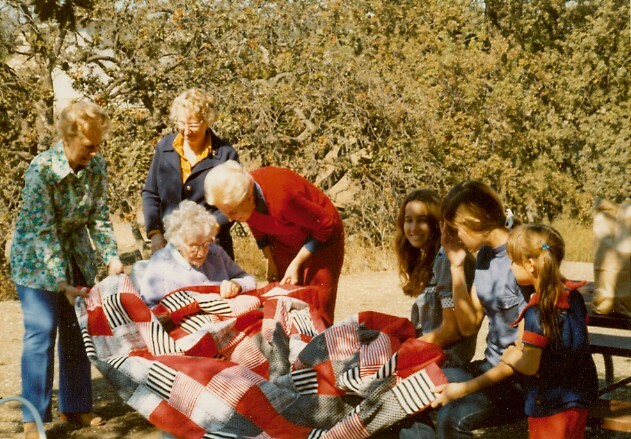 She loved to make quilts. We’d see her at our yearly family reunions and sometimes she came with a quilt for us. I still have four of those quilts. They are very dear to me because of their charm. Aunt Ada was almost blind when she made them. The pieces are odd and mis-matched. They are made from cut clothing and scraps and sewn with love. This first one below is one we had when I was a little girl. 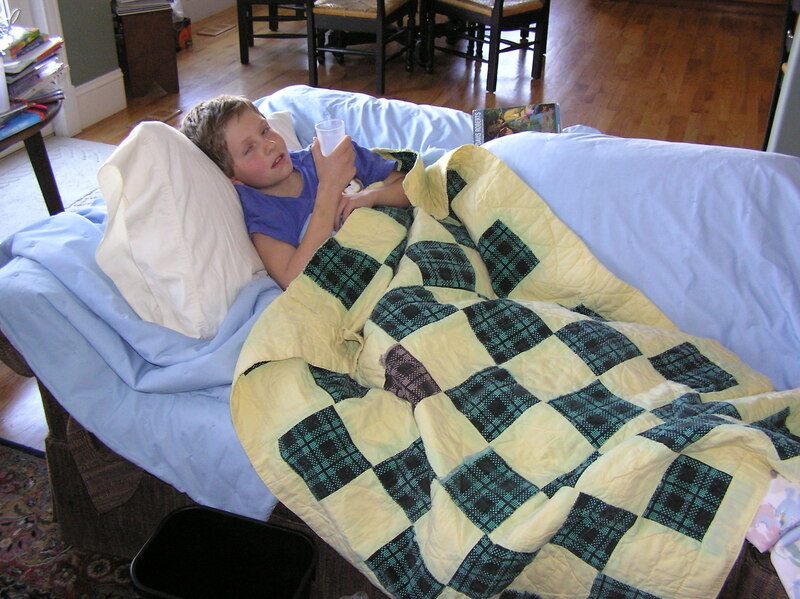 We called it our “Sick Quilt.” It was so ugly and small we only got it out when someone was sick, and we used it to cover the sofa in case someone might throw up. It became a dear quilt after many years of loving use. The sashing is a worn yellow and the patches are of turquoise and black corduroy with a couple of brown blocks thrown in. I associate this quilt with Lipton Chicken Noodle Soup, thermometers and my mother’s cool hand on a warm forehead. 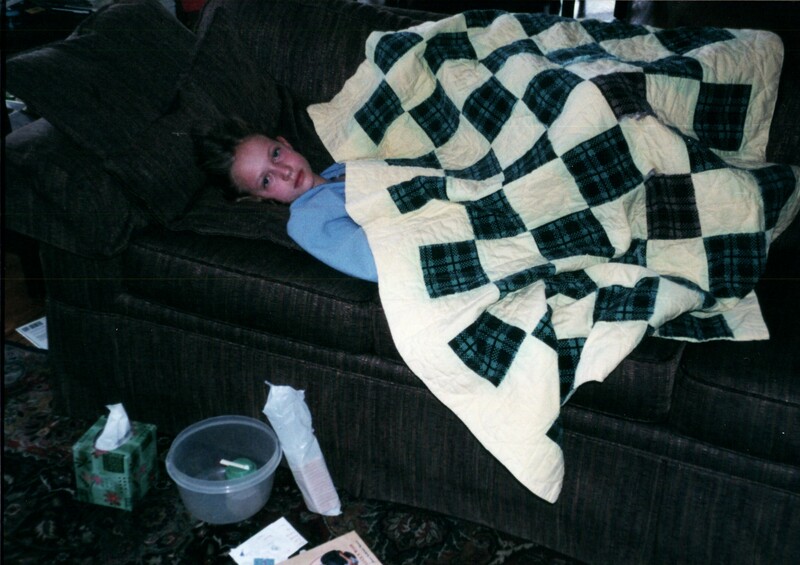 Below are photos of Claire and of Aaron on a sick days when they were little. This other is a scrap quilt made from pieces of old clothing. Both are hand quilted. Aunt Ada made a lavender quilt just for me when I was about 9 or 10 years old. My bedroom was lavender. 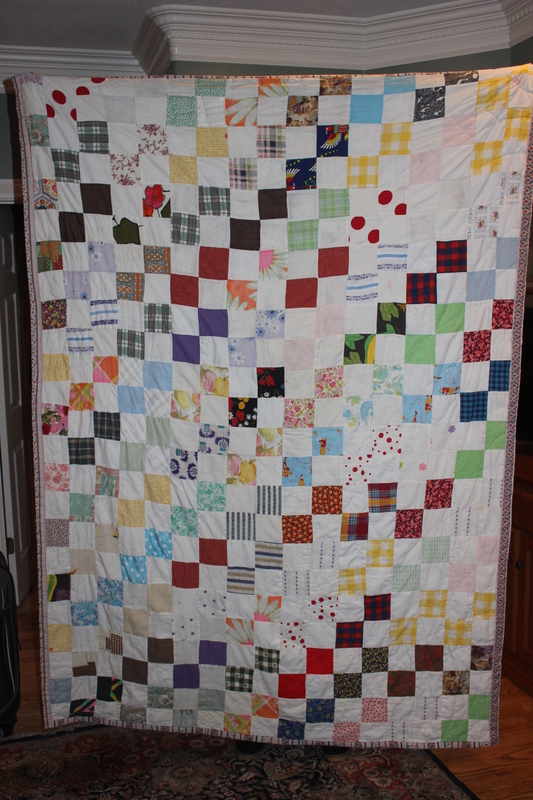 The blocks didn’t really match, but I loved the quilt because it was made for me. I will take a photo of it and add it later. 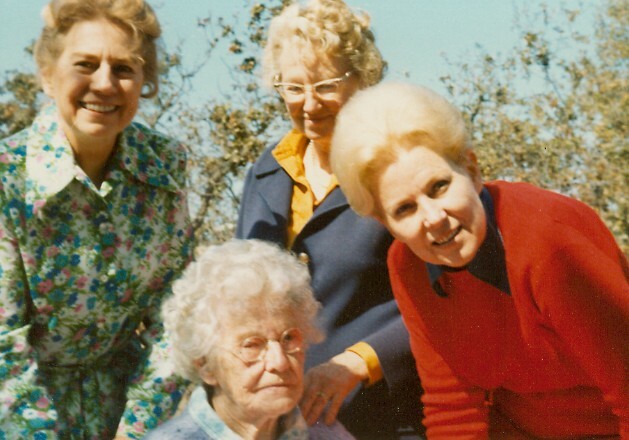 Here is a photo of Aunt Ada with her 3 daughters, Edna, Mary and Vicki, taken near the end of her life. She died in 1973. In the first picture above, I’m sitting between my cousins, Cheryl and Debbie Martell at one of our Family Picnics in southern California. 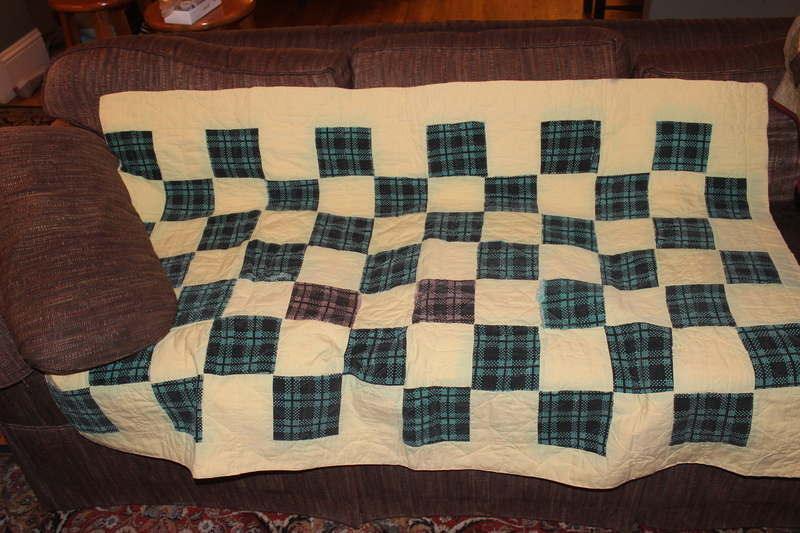 This entry was posted in Family History, Quilting. Bookmark the permalink.